There's a World of Water Parks in Branson! Branson has indoor water parks, outdoor water parks, and water parks that are both indoor and outdoor. Whether its a full scale outdoor water theme park, or one thats available right at your resort; no lake is necessary to spend a day in the water in Branson! Discover a Water-Logged Wonderland at White Water! The area's biggest water park is White Water; it's loaded with rides and slides at every turn! There's a variety of exotic, island-themed areas in this 13-acre, 2 million gallons of water, wet wonderland. Enjoy thrilling and relaxing rides alike... KaPau Plummet, Kalani Towers, Ohana Falls, Splashaway Cay, Raging River, Pipeline Plunge, Coconut Grove, Aloha River, and Surf's Up all await you. For a wet, wild, whimsical, and downright wonderful world of water, you've hit the jackpot with White Water! 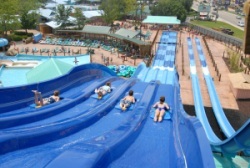 Water Park Resorts - Branson's Water Wonderful Way to Stay! Several area resorts feature exceptional indoor/outdoor water park experiences for their guests. These resorts can be the ideal - and nearly all-in-one - vacation experience for your family...just don't forget to dry off, get dressed, and get out and about to all the amazing shows and attractions Branson has to offer! At the Welk Resort, where you'll find comfortable and casually luxurious condominiums and hotel rooms, you can enjoy their phenomenal water park as part of a special Welk Splash-A-Torium vacation package. The Splash-A-Torium is a uniquely beautiful 10,000-square-foot facility with a 100-foot indoor water slide, and an indoor/outdoor swimming pool and hot tub. There's also the kid's favorite Splash Zone, where it's nearly impossible not to get soaked! Grand Country Gives Branson Guests a Grand Splash! 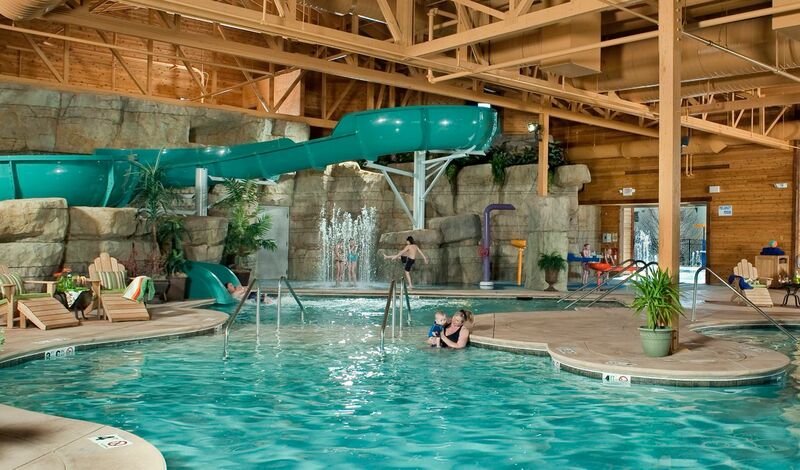 All Grand Country Resort's overnight guests have access to their Splash Country Indoor/Outdoor Water Park. There's a three-level tree house with interactive water play features, including a 1,000-gallon tipping bucket. A toddler pool, basketball play pool, lazy river, relaxing spas, a Froggie Bog with jumping water sprays, and Hatfield Holler, as well as comfy lounging areas can all be found at Grand Country. 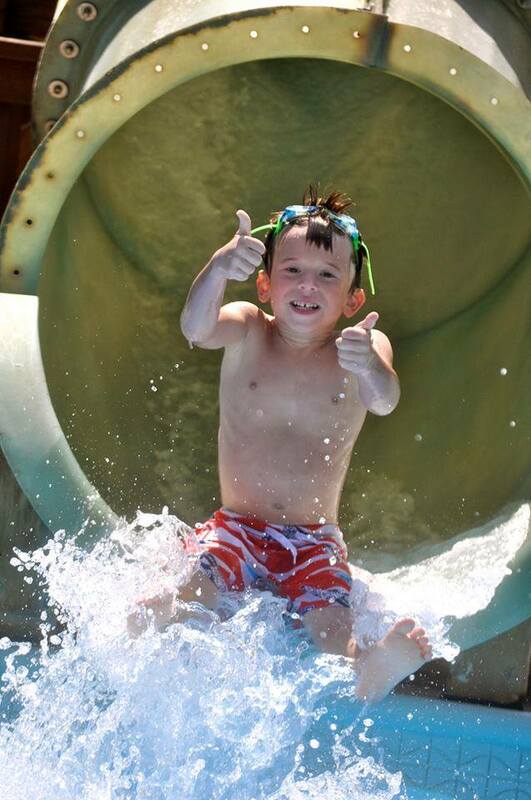 Branson's Castle Rock Delivers Water Fun Fit for a King! ...and a Queen...and all those little princes and princesses, too! 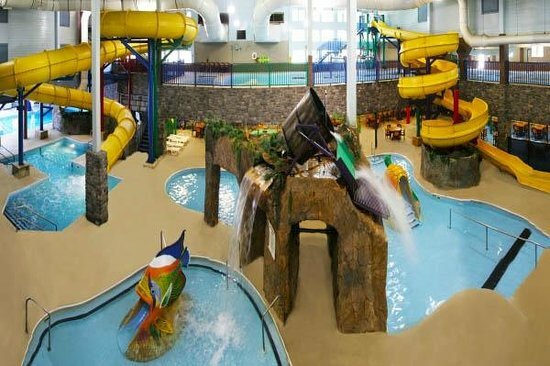 Castle Rock Resort has an impressive 40,000-square-foot indoor/outdoor water park. Discover two 500-gallon tipping buckets, and multiple indoor and outdoor kiddie pools with rain showers, waterfalls, and more! There's also an indoor lap pool and activity pool, as well as two large three-story thrill slides and themed water slides, a lazy river, and a multi-level sundeck. Branson's Still Waters Boasts Indian Point's Biggest Water Thrills! Although not technically labeled a water park, Still Waters Lakefront Resort features more water fun than most lodging properties, including three outdoor pools; there's the lovely Oasis Pool, and two kiddie pools. Kids love the Zoom the Flume water slide, and everyone enjoys the 15 foot swim-through waterfall. Once you're good and water-logged, there's a huge sundeck with sun beds and lounge chairs to relax and soak up a little sun! Water park fun can be found throughout Branson, and don't forget that most lodging properties offer either an indoor pool or an outdoor pool; some offer both, and the Radisson Hotel has a unique indoor pool that lets you swim right under a weather shield into the fresh, outdoor air to enjoy the rest of the pool! Water park fun can be found throughout Branson, and don't forget that most lodging properties offer either an indoor pool or an outdoor pool; some offer both, and the has a unique indoor pool that lets you swim right under a weather shield into the fresh, outdoor air to enjoy the rest of the pool! With water parks, swimming pools, and three phenomenal lakes, the Branson area has a water adventure at every turn!